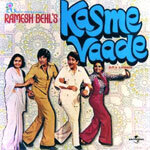 "Kasme Vaade" is a 1978 hindi film which has Rakhee Gulzar, Amitabh Bachchan, Randhir Kapoor, Neetu Singh, Vijayendra Ghatge, Master Bhagwan, Azad, Nitin Sethi, Sharat Saxena and Katy Mirza in lead roles. We have 3 songs lyrics and 3 video songs of Kasme Vaade. R. D. Burman has composed its music. Mohammad Rafi, Asha Bhosle, Kishore Kumar, Amit Kumar and Lata Mangeshkar have sung these songs while Gulshan Bawra has penned its lyrics.